rif and I went to Yong Kee for lunch today. 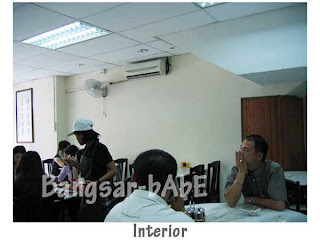 I was reluctant to go there but he told me his colleagues claimed the place serves good pan mee. *I seriously think they are deprived of good pan mee* I scanned through the diverse but uninteresting menu before opting for the hot and spicy pan mee. rif ordered the chef selection pan mee. rif’s noodles came with a piece of chicken drumstick and some vegetables as garnishing. I found it hardly appealing, and the portion was tiny considering the price tag attached. I tried some, and was less than impressed. The noodles lacked flavour; all I tasted was noodles and a slight hint of pepper and spices. The fried chicken was average, nothing to shout about. My pan mee took ages to arrive. rif was almost done with his before my piping hot bowl of pan mee came. One sip was enough to make me frown. It was a far cry from my ideal bowl of hot and spicy pan mee. While the broth was hot and sour, it was tasteless. There were 4 pieces of puny squid, 3 aneroxic prawns and lots of tomatoes. I kept adding chilli sauce and chilli oil into my noodles for flavour. I wouldn’t order this again. Lunch cost RM20.40 inclusive of a cup of Chinese tea. Not cheap, and certainly not up to par with other pan mee establishments around. I don’t think I’d come back; Village Park would be a much better choice for meals. Verdict: Skip the hot and spicy pan mee….EVEN THOUGH it’s under chef’s recommendation. I have no idea what’s good, but I did spy a few tables ordering sui kows. Pan mee at that kinda price, I rather eat chili pan mee or the pan mee in near UE3.